RAYMOND WEIL has designed a truly unique Buddy Holly watch with distinctive features and references to the artist. Automatic small second Steel on steel, silver dial, pale blue highlights. The 39.5 mm maestro has a polished stainless steel maestro case houses an automatic mechanical movement RW4250 with a 38 hour power and polished stainless steel bracelet. 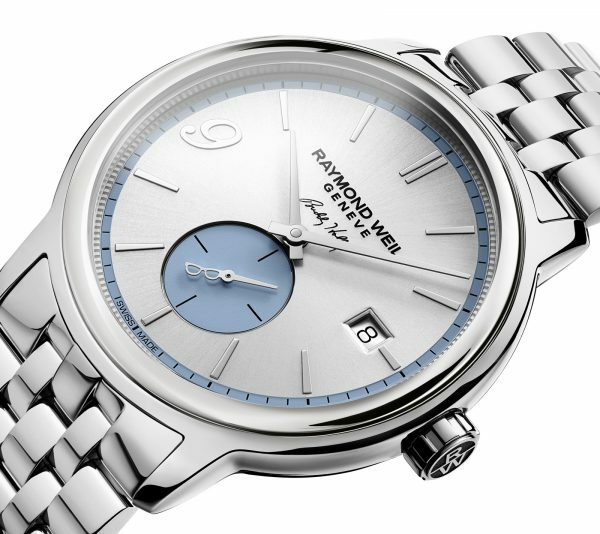 The silver galvanic dial has highlights of pale blue (Buddy’s favourite colour) encircling the rim, and on the secondary second sub dial, which also wears a miniature pair of glasses (the iconic emblem of the musician) on the sweep of the second hand. The oversized number 9, featured as a reference to Buddy’s lucky number, is balanced by the date dial at the 3 o’clock position with the emblem of Buddy Holly’s signature centered on the face of the dial. The smoked sapphire crystal exhibition case back references the tribute to the Buddy Holly Educational Foundation.